I�m no rum expert by anything resembling a long shot, but I know what I like. And three years ago, I liked going to the Miami Rum Renaissance Festival. A lot. With hundreds of great rums from around the world, what�s not to like? The 2014 version runs this year from April 25-27, at the Doubletree Hotel Miami Airport Convention Center, expanding from previous versions to feature more than 50,000-square-feet of exhibits and more than 80 rum producers showcasing hundreds of award-winning and notable rum brands. 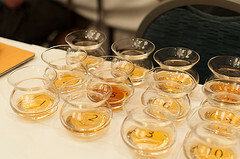 Events include rum seminars, with proceeds benefiting The Museum of the American Cocktail in New Orleans, and some are �The Wonderful World of Tiki Cocktails,� by global rum ambassador Ian Burrell; �Cocktails in Literature,� by Phil Greene of the aforementioned museum; and �Lost Spirits Navy Style,� by master distiller and blender Bryan Davis. There will also be a world tiki cocktail champion named, sponsored by Bacardi and featuring mixologists from America and the United Kingdom; an island lifestyle showcase; and the �Rum XP Tasting Competition,� which brings leading rum experts from around the world to judge winning rums. Tickets are $50 per day for general admission ($75 for VIP) and $150 for a three-day VIP pass, which when you think about it, isn�t a bad price to pay for tasting a considerable amount of rum. Burr said Miami is the number one rum market in the world, and among all the festivals the city hosts, his was judged number one by the Miami New Times. The event literally offers rums from A to Z, from Abuelo 12 to Zafra 21. For all information, check out www.miamirumfest.com. It�ll make you thirsty.